A popular Polish beach resort famous in the summer months, Międzyzdroje is a breath of fresh air and a hive of activity. It’s a party town, a border town (just 10km from the German border), a beach resort and a place for enjoying time off work. 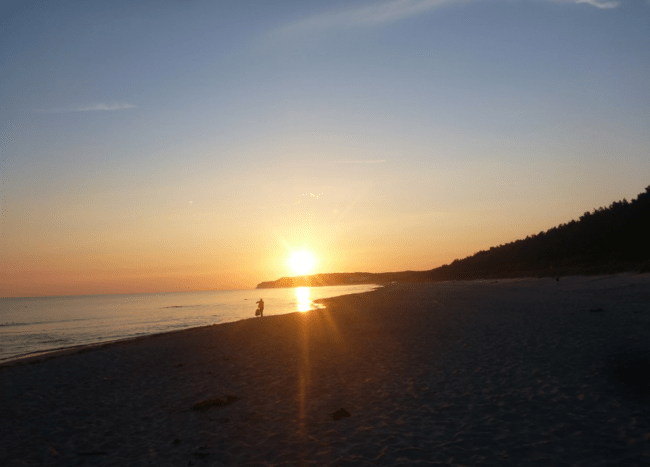 The town is awash with top-notch attractions and is a wonderful place to watch sunrise or sunset due to its pristine coastline location on the Baltic Sea. It’s no wonder Międzyzdroje is classed as the “The Pearl of the Baltic” and here’s why. When you find out that Międzyzdroje has a load of crazy activities to partake in (upside down houses, nudist beaches, halls of mirrors, wax statues of Stalin and Michael Jackson etc. ), suddenly you realise why this town is so busy in summer months. It’s more than just a hub between Germany and Poland. The Maze of Mirrors is a peculiar place to lose your sense of reality for starters. Are you looking at yourself 1,000 times? Why is your little brother smaller than you? Within this cool fun house lie the answers. 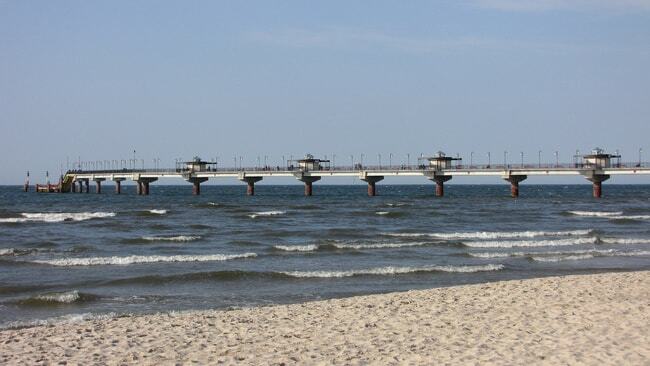 Międzyzdroje has a famous pier, known locally as Molo w Międzyzdrojach. At the start, indulge in the best ice cream, coffee, waffles and cocktails the bars and cafes have to offer and then head to the pier’s end to admire the views. To your left lies Germany, to the right is the rest of Poland’s gorgeous Baltic Coast. The real beauty is the freedom, the peace and the tranquility of it all. It’s hard not to fall in love. Amusement arcades, rides, games and fun parks are all the rage in Międzyzdroje, which has more amusement arcade machines and theme park rides than most towns in Poland. Come nightfall, the huge array of fun parks open their lights and sounds to attract even the average passer-by. You can find dodgems, hoopla, rollercoasters and fun and games for all ages. Bring plenty of coins and notes because payment on card is just not so popular or common in these amusement parks. 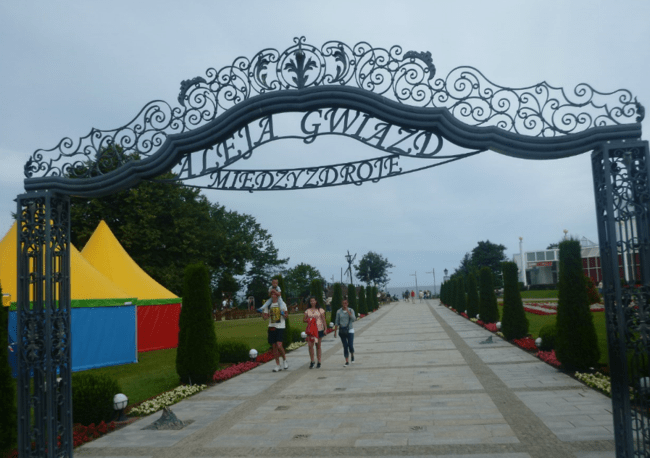 Międzyzdroje’s seafront also has an outdoor tribute “Walk of Fame/Avenue of Stars” (in Polish “Aleja Gwiazd”) dedicated to famous Polish people down the years who excelled in their fields. This walkway leads down to the beach just east of the main pier. On your walk you will see handprints and dedications to the celebrities, some of them also have statues in the park just in front of it. 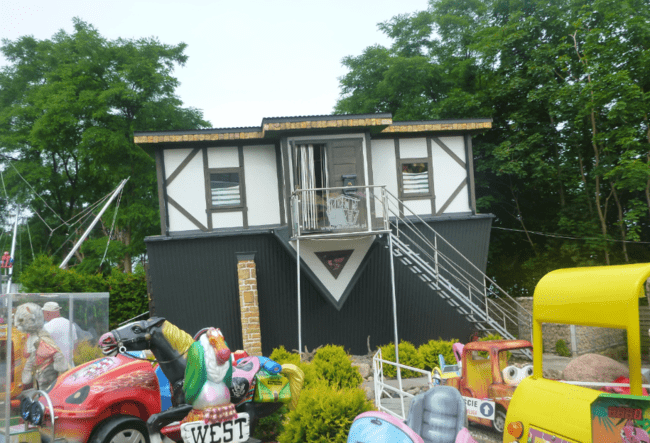 While Pomerania’s seaside town of Sopot boasts the famous Crooked House (Krzywy Domek), here in artistic Międzyzdroje, you can enter a house that is upside down, and that includes what appears to be beds on the ceiling and upside down toilets. It’s a crazy place and sits in a park down near the pier. Ok, so it’s only a Wax Museum, known as Międzyzdroje Muzeum Figur Woskowych, but hey you don’t have to tell your friends that when you share your selfies on Instagram. Head to Międzyzdroje’s popular Wax Museum to find life-size models of Freddie Mercury, Spiderman, Spongebob Squarepants and Albert Einstein. Disturbingly there is also a section with Osama Bin Laden, Hitler and Stalin in their gory glory. A nudist beach in Poland? Sure thing, Poles are not the shy type you thought, they just do it in more remote places and don’t constantly promote it and Lubiewo offers a real taste of purity and freedom. In summer months, you can lose your robes at the tranquil beach here at Lubiewo, just a few kilometres west of the main beach in Międzyzdroje. It’s perfectly legal and a cool secret spot to know. Beware of mosquitos at sunset though!